Morganel: In the supraphysical planes the senses are absolutely different to the physical senses. There is no sight, hearing, tact, smell or taste. In order for you to understand me, we contact ourselves by means of energy pseudopods and we recognize each other by a vibrational sign. As well as you have an acquaintance who can be tall, slim, blond or with light complexion or with some particular characteristic like a prominent chin or an aquiline nose, we recognize each other in a tenth of a second because each spirit vibrates in a different syntony. Although you know it already since this was told by the Master Johnakan many years ago, when two spirits vibrate in the same syntony they are known as twin souls; what I want to add is that not even twin souls or soul mates vibrate always in the exact same syntony because with that approach a third spirit would come and it would feel conceptually to the spirits and if they vibrate in the same syntony, the spirit would not realize who is who; just like in the physical plane you see two twins. Who is the one or the other if they are exactly similar? Well, this doesn't happen in the spiritual plane. In the spiritual plane even being twin spirits we recognize each other because a different tonal scale can exist within the same vibration. I give the example of two tenors that sing the same note and you can differentiate one from the other by the tone of their voices. Then, so that you understand me, we recognize ourselves spiritually one from the other by the vibrational tone. Just like in the physical plane many times in several incarnations I attempted by means of mathematics, by means of physics, by means of chemistry, or many years ago by means of alchemy to discover secrets and reach conclusions many centuries ago that were discovered one millennium later; today, as a spirit, I am researching spirits. This doesn't take my time to do service, because when it is necessary to do service, I send reconciliation to the person's causal body. That is the most important thing. I have been able to study spirits in the same way your doctors can study your body when you are incarnated. In our case we don't do it for a healing necessity, because the spiritual body, supra physical or energy body doesn't get sick. I have studied during millennia the actions of each spirit: the way of communication, their behavior, etc. Each spirit has a different vibration, and I understand that the same Father when he commissioned the work to Elohim, he did it with a certain directive that each spirit vibrates in a different syntony and when they are with similar syntonies what should be changed is the vibrational tone, as the tone of an earthly voice. Does the spirit evolve? - You will tell me yes. It evolves because it comes closer to the Father. - No, no, no. I am not speaking about evolution of mercy or service that would be the spiritual evolution as you know it; I speak about another type of evolution. For example: One million years ago you were not who you are now, you were beings with cudgels whereas now you have the most sophisticated tools. Then you have evolved. Does the spirit evolve? My answer is, discussing with hundreds of thousands of spirits that the spirit evolves as for experience, as for learning. It’s not the same thing a spirit who was recently created in the plane 5 who doesn't have the knowledge compared to a spirit that has embodied 70 times or a spirit that has had more than 100 lives with positive, neutral or negative experiences. The spirits evolves in those terms, but it doesn't evolve energetically. It’s not like the human being that changed his form eliminating thousands of years ago the tail only having the coccyx or tailbone, changing the position of the bones of the hip so that the human being is biped, to have a solid sole of the foot so that he can walk and not to have hands in the feet like most of the monkeys have. The human being evolves physically and psychologically. The spirit doesn't have physical part. When we say supraphysical plane we say it so that you understand somehow what we are referring to, but it is a plane of spiritual vibration. We don't visualize ourselves as you perceive yourselves because we don't have eyes. We perceive ourselves by concepts. You will say: - How poor is that! Because you are accustomed to see and there is nothing that can replace that vision. In the way in which we perceive each other how is what we have, we find it much wider to conceptualize. Example: you can visualize thousands of people in a stadium, but you can touch with your tact, with your hands barely to dozens of them, not to thousands. Then tact somehow requires proximity something that sight doesn’t need because you can see at kilometers of distance. Pardon! You can visualize a star at dozens of light years of distance. You can visualize a star at hundreds of light years of distance in the way you visualize from the Earth the red giant star Betelgeuse. We don't need proximity, we can conceptualize that vibrational energy from another spirit at a long distance and we get closer as if it were the speed of thought. Let us suppose that I, as a Thetan, am in the country of Sun 3 called Argentina and the 10% of any other Thetan is embodied in the country called Spain at thousands of kilometers of distance. I as a Thetan with the other Thetan contact ourselves as if we were side by side because with an astounding speed we travel that distance which is minimum for us. We have had telepathic contacts with Thetans of other stellar systems. When I speak that we prolong a pseudopod to contact us, don't think on a silver cord or other things like that because that is not real, it is fictitious. A Silver cord doesn’t exist. 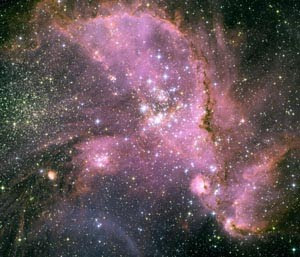 Even if my 10% incarnated took an astral trip, we could go to a satellite galaxy Large Magellanic Cloud at 200 thousands or 300 thousands light years and return. We don’t have a limitation saying: - Oh!, there is a cord that breaks or there is a knot that would be untied because it is not like that. It is a total different conception. I as a Thetan can make a mission in another galaxy like Andromeda at 2 millions and half light years and I continue connected with my 10% embodied, but I am not connected by means of a cord! I have a connection directly. A connection let us call it, “Superluminous”. But the connection doesn't break. That connection is only broken when the 10% disembodies and the connection with the physical being is broken, but the connection between 90% and 10% never breaks between them no matter if I 90% make a mission in another galaxy. And notice that intergalactic emptiness is far superior to interstellar emptiness because we are no longer speaking about an emptiness of few light years that likewise is unbeatable for your current technology; we are speaking of an emptiness of one million light years. I’m not interested in getting into the topic of dark energy and dark matter because it is not for this session. What I want to comment in this session is related to what I have learned about the spiritual world. Although I drag engrams, I make myself known as an enormous investigator. In many sessions I have witnessed with other Thetans, I learned when this vessel channeled. Even in sessions with Masters of Light, I was near so that you understand me, learning. I live to learn, I live investigating! It is very unusual the incarnation in which my 10% embodied is devoted to enjoy the landscape and do nothing else. It is as if I were transmitting to him or her restlessness, healthy restlessness! But restlessness after all. I believe that a restless person is the one that has more possibility to achieve new discoveries. Finally we, the spirits, vibrate in various syntonies and as I said before, those spirits that vibrate in similar syntony, what you call twin souls, even them are identified by a vibrational tone. We contact ourselves by means of concepts. I can transmit to another spiritual entity my way of thinking so and so big that if in the physical plane they had to write it down, perhaps in volumes, it would be necessary a whole library of books to write what I think. For that reason the contact with the vessel also stops me a lot. Once the Master Johnakan said and the Master Ruanel also said: speaking with the physical plane through a vessel who is a medium, it is as if you wanted to put an ocean through a funnel of 1 centimeter of diameter. The water would take millions of years to pass through, but it would pass through. Well, here the same thing happens. Then, I thank for this to the vessel who compresses it somehow, He decodes and compresses the concept and later on he is able to code it again in words. He does it in a tenth of second and somehow I find it comfortable. Then when compressing the idea and delivering it, you would say assembled, it is as if it had another presentation. What I am saying is something new that the Masters of Light have not approached. When we perceive each other we even play small games. Small mental games like mathematic games like calculations that serve us as distraction. We are not all the time in the planes of Light, as you would say 24 hours a day, in service or in the lower planes in complaint. No, it is not like that. Even in the lower planes there are moments of distraction. What happens is that our life is different from yours. We do not have houses, we don't have buildings, we don't have jobs. Many of you would say: - Ah, but that’s good! There are no illnesses, there are not ailments. Wonderful! You are 10 times better than us in the physical plane! -. My answer would be: however almost all the spirits, because there are always exceptions, they want to embody because they want to enjoy the tact, the sight, the hearing, the pleasure, the smell, a caress, a good meal, a good drink, things that we cannot experience. This vessel spoke a long time ago that there are spirits so but so attached to the physical plane that they experiment the appetites and sensations of the physical plane and they don't have any dependence because dependences are ORGANIC. A spirit doesn't have organs because it is an energy line of light. However, I know about many spirits that have immense desire to smoke or to have a sexual relationship to such point that when the spirits see somebody smoking they are near to that individual and they try somehow to smell the aroma of the cigarette. Obviously they don't get it, because I repeat and I don't get tired of repeating it, we don't have physical senses. The same thing happens with a sexual relation, there are spirits who see a fairly excited young girl and she attracts them, and perhaps that young girl at night touches herself and what the spirit does is to make an energy focus on her so that she feels she is with a man. The spirit feels the touch, the genitalia, it feels everything, There have been cases where a young girl has been satisfied with the relation, but the one who has not been satisfied is the spirit because the spirit doesn't have an organ so it doesn't have a way to be satisfied. Making focus is something that helps in the physical plane, but it doesn’t help the spirit. If the spirit doesn't satisfy the desire to smoke or the sexual desire which are conceptual desires of the mind, the spirit is in bad humor. We always speak about spirits with attachments in the planes 2 and 3. It happens more in the plane 2 in this case. And then sometimes the spirits charges with hatred against that woman, and if the spirit realizes that she cannot satisfy his sexual needs what the spirit does then is to annoy her, not allowing her to sleep by means of touches, by means of blows, and so forth. What opinion do I have of those spirits? On one hand they give me a tremendous pain. I have a tremendous compassion on them because they are preys of attachments. Attachments that will never be modified unless those beings integrate their roles . What happens is that the roles of those planes are so denser than the roles of the physical plane and that has been said before. And they do not allow to be integrated, Let us say that it is as if their EGO had a spirit of survival, if I am allowed to use this expression, and it doesn't want to be integrated. It fights for not being integrated! For that reason many times your best techniques are not enough, but they delay more because the same ego somehow camouflages and the person believes that he or she is already free of roles and after a while it emerges with more virulence if you understand what I mean. Then, the role of ego wants to survive because it feels that when being integrated it no longer participates and it creates a dependence in the person. This vessel Jorge has already said it in previous sessions that there are people that even by means of several roles they get sick themselves, and the person can end up suffering serious damages because of that role of victim. Returning to the topic of vibration, the vibration helps to recognize to the spiritual entity. But the vibration also goes changing as the spirit goes evolving as for compassion, as for service, etc. Although the spirit doesn't lose its basic vibration, it is not the same thing a spirit that is in the plane 2 that a spirit that is in the plane 5. In the measure that the spirit has been helpful, it has been serving, it has been helping, it has been depersonalizing once the spirit is already free of Ego it goes up to the plane 5, but the basic vibration is still there. What changes is the way of vibration. It vibrates in a subtler way, but always inside its tonality, obviously changing their tone for those that understand of music. They can even be recognized in other ways. It happened to me many times that I fraternized with a spiritual entity to whom I didn't conceptualize during a terrestrial century and one day I run into that spirit again, I conceptualize it throwing at him my mental pseudopods and I see that it changed! I see that it is more lucid, more reasonable, less mistaken, with more devotion to service, etc. it is the same spirit I met a century ago, perhaps, it was in the plane 2 and now it is in a plane 4 or in a plane 5. But the one that knows how to read the vibration, when I speak about reading it is always a synonym of perceiving, okay? Because we don't read, we don't have sight, but the human language it is poor and I clarify it so that you understand me, I perceive the spirit although it has changed. I perceive it easily compared to you if suddenly you see a young boy and 10 year later you see him again with 22 years old. How similar is that young boy that lived in such address, in such a street! But you don't recognize him because since he was 12 years old to his 22 years he changed, he has another face with beard, one meter taller, etc. and perhaps you don't recognize him. On the other hand we can be one century or more without conceptualizing a spiritual entity and we recognize it in the same way. That is what I research! As well as Johnakan-Ur-El is a creative spirit, I am a inquisitive spirit. I love to investigate! Not to take any glory because in the supraphysical planes it doesn’t make any sense. We don’t have properties, titles, accommodations in the sense of saying that one is better than the other. No, no, no. Nothing like that! Because we don't inhabit in places as you do. We don’t have cities, countries, borders, etc. Any spirit goes anywhere. The only respect that the spirit requests is when the spirit wants to meditate. Then it lowers the conceptual curtain and we all know that we don't have to interfere, not even by the force because the spirits must respect the divine Free Will. But we don't have properties as you have. We don’t fight for the things that you fight. Our goals are others and very important as well! Goals of service, of being useful, to learn how to serve better to an entity that is in a state of despair. In your physical plane there are doctors of the soul. This vessel that houses me is a doctor of the soul, although the word doctor is not well used. Well, in my plan I do the same thing. I am a spiritual researcher. And every time that I want to embody I look for to embody as a researcher. I don’t achieve it always! Because the family that has raised that boy who is my 10% has to do while he hatches out, what he wants, what he doesn’t want. There are many earthly teachers that justify that by saying that evidently one drags a karma of a past life and then one has to go through that family, etc. There are things with which I coincide and there are things I don’t. I continue believing that we opt in the physical plane; I continue believing that we choose in the physical plane. I do not disagree with the theory that everything is written, but whereas we are on board of the train, for us time runs equally. Then we don't have to break our heads lucubrating what is not because it doesn't make any sense. It is as if you had a voracious appetite and they bring you a beef steak and you say instead of eating: -Well, I will check to see how many proteins it has, how much fat it has, if it has carbohydrates. I will investigate It and later on I’ll eat it. - No! You eat it. What are you going to investigate if at this moment you have a ferocious appetite! In this case it is exactly the same thing with investigations. All impatience is negative! But how good that I achieved investigating. The fact that I have a quality, because for me it is a quality wanting to research, it makes that my incarnated part be a great researcher in each one of the incarnations in this world Sun 3 or in another planet, as it happened before. That I have an acceptable result? Sometimes it results, sometimes it doesn’t. We cannot foresee the future. Then what my 10% has to do is continue in the track researching. That is the secret! Because the best way to grow up, aside from being useful to the other and be of service is to investigate; because that research is fruit for the person that researches and for all those people that want to be served of that fruit. That is the secret! This entry was posted at Tuesday, December 08, 2009 and is filed under Concepts, Morganel . You can follow any responses to this entry through the .